There is a small fee to access Flowerpot Island. This may be paid at the National Park Visitor Centre in Tobermory or at the Bruce Anchor Cruises boat tour ticket booth. 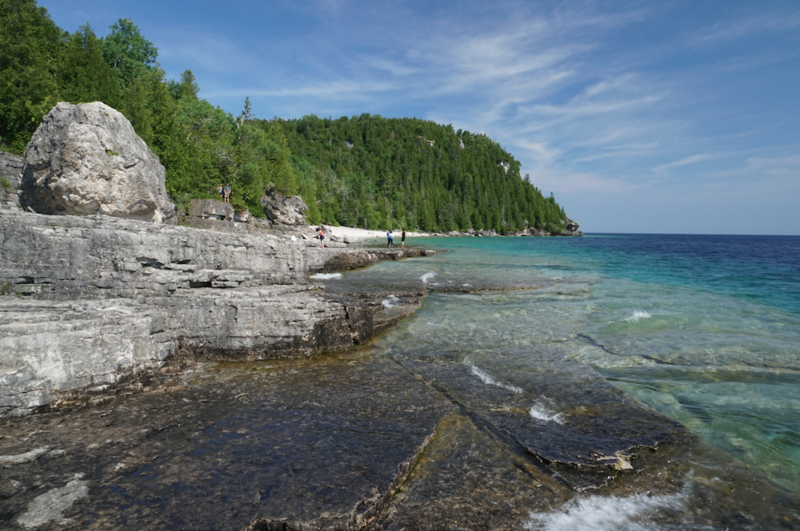 Hiking Flowerpot Island is the best way to see all that the island has to offer. The loop trail starts at Beachy Cove, taking you past the small and large flowerpots and to the cave where you may choose to climb the stairs to the cave platform. From there, it is just a short hike to the lightstation. You may return to Beachy Cove the same way along the coast, but those who would like a challenge may follow the remainder of the loop trail, which offers a more rugged and adventurous hike though the interior portion of the island. As you explore the island you may notice caves in the rock. Flowerpot has many caves, some of which are accessible, and others that are not. 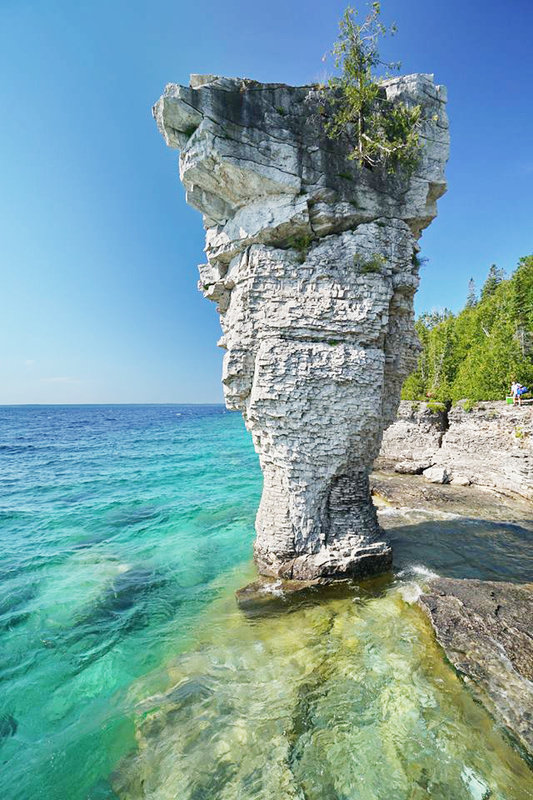 These caves were formed after the last ice age approximately 12,000 years ago when the glacial Lake Algonquin completely covered Flowerpot Island. As the lake levels fell in stages, the cliffs were exposed the eroding effects of the lake for varying durations of time. This phenomenon caused numerous caves to form in the cliffs in various sizes and locations throughout the island. 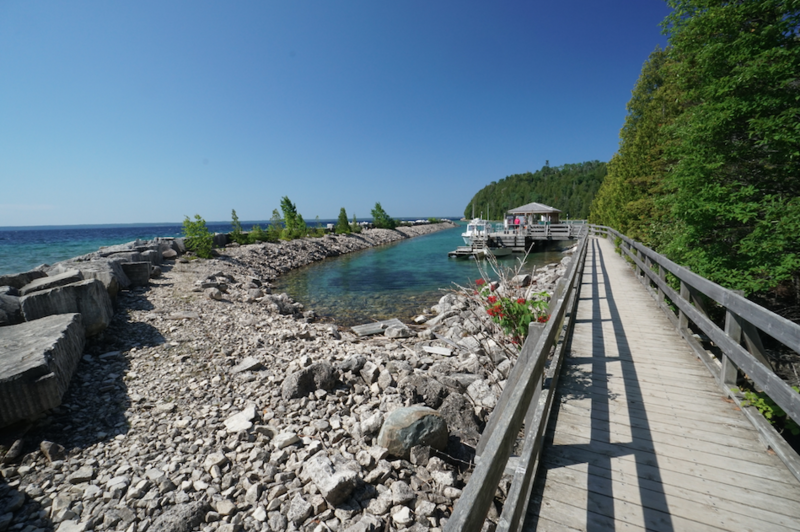 The historic Flowerpot Lightstation is a must-see feature of Flowerpot Island. Built at the turn of the century, this lightstation was maintained by lighthouse keepers who lived on the island from April through December. With the development of a new technological era, the once manned light was replaced in the 60’s with the new steel light tower that stands today on Castle Bluff. The observation deck marks the location where the original lighthouse once stood. The three-structure station on the north side of the island is maintained by a volunteer group, the Friends of Fathom Five. Volunteer lighthouse keepers stay on the island during the summer season to keep up the grounds and welcome the many visitors to the island. The original lighthouse was constructed in 1897 to guide ships safely through the once busy shipping channel located just north of Flowerpot Island. The original building did not look like your typical lighthouse, it was a rectangular wooden building perched just shy of 90 feet above the water level on Castle Bluff. Another building was constructed on Castle Bluff in 1909 for the purpose of housing the fog alarm machinery. The original lighthouse and fog horn buildings were decommissioned in 1969 and a steel tower was erected to replace it. The steel tower is fully automated and is still in operation today. Today Flowerpots viewing platform occupies the area on Castle Bluff where the fog alarm building once stood. In 1901 the two storey light keeper’s home was constructed, and in 1959 the one storey light keeper’s assistants home was built. Flowerpot Island light station was manned for 90 years, during that time light keeper’s and their families spent April through December every year on the island. The lightstation was unmanned from 1987 on, and the abandoned buildings began to deteriorate, this became of growing concern until 1995 when an agreement was reached between the Friends of Fathom Five and the Canadian Coast Guard. A devoted group of volunteers began the long and labour intensive process of restoring the site in 1996 and have maintained the grounds ever since. During the summer months those who visit the island may journey to the lightstation via Flowerpots trail system. The volunteers are usually there to greet you and sell you refreshments if you need one, there is no fee to enter the homes to explore although donations are welcome. The Ottawa’s legend of how the Flowerpot rock formations came to be. This story was printed in the Owen Sound Sun Times in 1944. “She was Shining Rainbow, Daughter of Waubesee, a chief of the Ottawa. He was Bounding Deer, a son of an enemy tribe of Chippewa. While the tribes were on peace terms for a season, the two met at a camp on the mouth of the beautiful Saugeen River at Southampton. There Bounding Deer brought Shining Rainbow dainty birch bark baskets filled with glossy blackberries and later, with her eyes upon him he far outshone his brother braves in the games which entertained the visitors. Soon she promised him that she would leave her people and go with him to the Saugeen. Their elopement was hastened because her mother, Spotted Turtle, had whispered to her that Waubesee had promised her to Swift Arrow, great warrior of their own band. Further, she said that the Chippewa would soon make war on Bounding Deer’s People. So one night in the Moon of Strawberries (June), Bounding Deer pushed his canoe away for the last time from the flat rock that had been their trysting place for a long time. The fact that it was the last time did not worry him for in the centre of this graceful canoe sat Shining Rainbow and she was leaving her people forever. Out on the lake they moved as the canoe slipped like a slim, swift bird through the waters, for pursuit was expected. For hours Bounding Deer’s paddle rose and turned in the moonlight, and when the moon had made the shadows short, they were within sight of Manitoueses. This was a sacred island off the mainland of the long-point-juts-out-into-Lake Huron, as the Indians called the Bruce Peninsula. This was the home of the lesser devils and the Little Spirit, and of a thunder bird egg. No Indian who had set foot on this island ever returned. It was shunned by all, and Bounding Deer, though glad to see the island for it told him that he was nearing home, instinctively drew his course away from it. Scarcely had he done so when a thrill of horror ran through him, for Shinning Rainbow was calling “Look! Look!” and looking, he saw, far behind, three large canoes – and the moonlight gleamed on twenty paddles! What chance had the frightened fugitives? Bounding Deer knew only too well that they had none. Shining Rainbow knew it too. She offered to throw herself over the side of the canoe and swim back to meet her fate, allowing her lover to escape, but he would not listen to her. “It might be that the Little Spirit would have more pity on us than your brothers” he suggested. Shining Rainbow agreed, so when they saw that their pursuers would not fail to take them, they turned straight to the shore. Shining Rainbow’s brothers, who really loved her, saw with horror what was planned. They tried to call to the desperate pair and the big canoes flashed through the water in a last minute effort, but the solitary canoe was not in the shadow of the headland of the island, and they were too late. No sooner had the bow of Bounding Deer’s canoe touched the shore, the watchers in the other canoes felt the waves rise in billows as the result of a mighty upheaval, and their ears were deafened by a loud crash. When the canoes were steadied again, it could be seen that the island had split in two! There on the shore were the petrified figures of the two they had followed. The Little Spirit had once again spoken to his people. Many visitors like to bring lunch with them and have a picnic on the island. There is a picnic shelter on the shoreline near Beachy Cove and picnic tables at the lightstation. If seating is not of concern, eating lunch on the shoreline near the flowerpots is a lovely scenic option as well. Tap water is not available on the island so make sure to pack your own. During the summer months drinks and snacks may be available at the lightstation. Taking a dip in the refreshing water of Georgian Bay is a popular activity for those visiting Flowerpot Island. Common areas for swimming and snorkeling include the picnic area by Beachy Cove and at the flowerpots. Remember to be careful as the shoreline is rocky, the water is cold, and there are deep drop-offs not far from shore. It is important to note that there are no sand beaches on the island so you may want to bring water shoes with you. Also, you may change into swimsuits in the washrooms at Beachy Cove. There are 6 campsites located near Beachy Cove. Pre-registration with Parks Canada is required. To inquire further or make a reservation, call (519) 596-2233 or stop at the Parks Canada Visitor Centre in Tobermory. Bruce Anchor Cruises will transport campers, carrying a modest amount of gear, to the island. Campers must select a departure time after 4:00pm on check in day and a return departure from Flowerpot Island before 12:00pm on the day of check out.